Welcome to my Web Page. Please bookmark this page if you intend to return to the site. By visiting this website, you are about to embark on a journey through Confederate Philately. All the various sections are listed on the toolbar at the left. Clicking each button on the toolbar in turn will open that section in this frame with the toolbar always remaining at the left for easy navigation. Use the Site Map for an outline view of the complete website. For the optimum visual effect, it would be best if your screen was maximized. The listings and the images of the stamps and covers are best viewed with Internet Explorer. Firefox and Chrome will not show the table border frame colors. For example, this table has a two color blue and red border in Internet Explorer but only shows as two shades of gray in Firefox. Please do not forget to sign the GUESTBOOK when you have finished browsing the site. I certainly hope that you will enjoy your tour of Confederate Philately. If no tool bar appears in a frame at the left, click HERE. 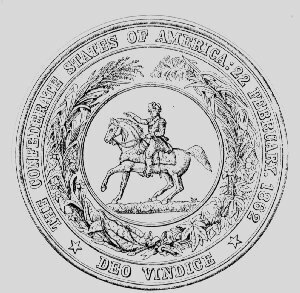 This Confederate Philatelic website, which is totally non-political and non-sectarian, has been continuously operational since February 1997 and has grown into a major source of Confederate Stamps, Postal History (Covers), and Currency for both the beginner and the advanced CSA Philatelic Collector. This website was entered in the 1999 APS Philatelic Literature Competition and was awarded a Silver Medal at the APS Stamp Show '99 held in Cleveland, Ohio 25-29 AUG 1999. Click on "Dixie" or "Bonnie Blue Flag" above for a rendition of these popular tunes of the South. Will play with any standard Midi-Player application. Depending on how your browser is setup, they may play automatically when downloaded, or you may have to manually open the file after downloading to hear them. 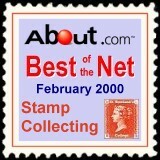 "The Stamp Collecting Guidesite at About.com is proud to award the About.com "Best of the Net" award to you and the CSA Stamps and Postal History web site. It was selected because yours is a terrific mix of quality content, demonstrating outstanding knowledge of the topic, and quality design based on the site's usability, dependability and creativity." The preceding quote is from Mike Mills, the Philatelic Internet Columnist ("The Glassine Surfer") for the American Philatelist. He has honored this website with a Philatelic "Best of the Net" award. Click on the logo below for a direct link to his stamp collecting website. This website was selected as "Stamp Site of the Week" for the week of 4 FEB 2001 by a world wide philatelic website evaluation team based in New Zealand. A review of this website appeared in the "Stamps on the Internet" column by William F. Sharpe in the April 5, 1999 issue of Linn's Stamp News. Click on the title if you wish to read the review article in its entirety. All photos, images, and text used throughout this website are the personal property of John L. Kimbrough and are not to be downloaded and used for commercial reasons without permission. Text pages may be printed out and images downloaded for personal use only. Anyone who wishes to link to this website may do so by linking only to the initial Index Page at www.csastamps.com. Direct links to any of the internal pages on this website without express permission are prohibited.